Thanksgiving is over and twinkling holiday lights have started to pop up at shopping centers everywhere. With Thanksgiving over, Holiday Shopping Season has officially begun and with that the start of advertisements galore. One of the icons of the holiday advertising season is the jolly old man who lives in the North Pole – Santa Claus. To recap for those unfamiliar, Santa Claus is the modern day figure that reportedly lives and works at his workshop with his elves at the North Pole. There they make toys that they give to well behaved “good” children on December 25th. 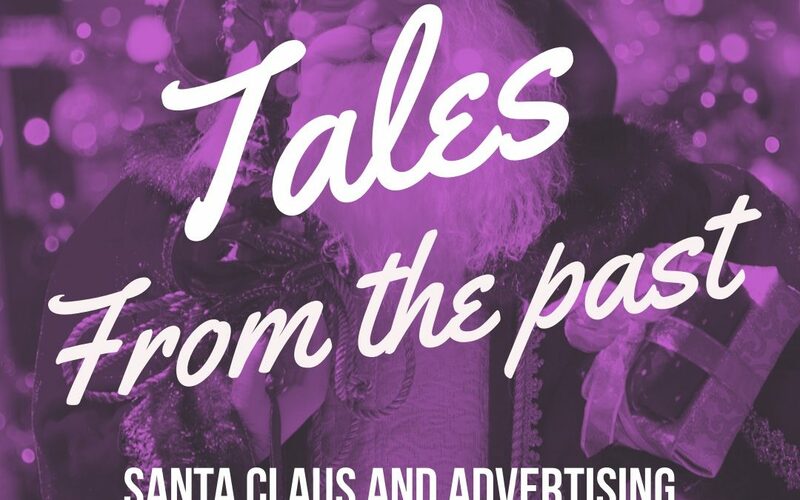 As a graphic designer in Orange County, California and a life-long advertising enthusiast, I got curious about how long Santa has been advertising products. When did he start advertising products and why are ads with Santa so darn popular! So after much research, I’m sharing with all of you what I’ve learned! Santa Claus was created somewhere in the 1700s. He’s based on a few different legends, and traditions including the Dutch Sinterklass and the British Father Christmas. Both of those figures were actually based on a fourth-century Greek bishop called Saint Nicholas of Myra who was known for his generosity and gift giving. As time progressed and traditions came to the USA and melted together we eventually got the modern version of Santa Claus. Santa Claus has been the brand ambassador and spokesman for a number of products over the years. 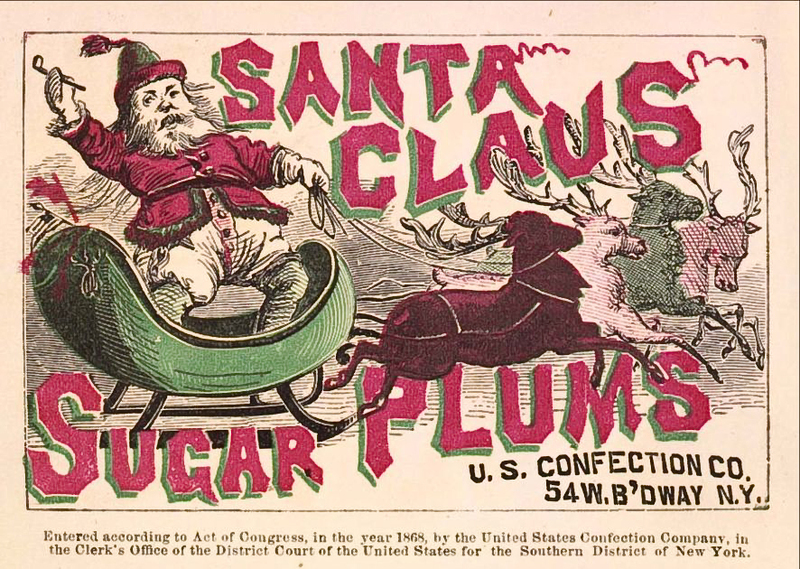 The oldest known advertisement featuring Santa Claus has been traced back to the late 1860s. Santa is seen standing in a sleigh with two of his reindeer in front. He’s wearing a red and green hat, red jacket and white pants and he’s selling a type of candy called “Sugar Plums” for the U.S. Confection Co in New York. All through the last part of the 19th century and the early part of the 20th century, Santa Claus was featured on everything from magazine covers to wartime propaganda. His now traditional look was solidified during the 1920s when Saturday Evening Post Magazine artist Norman Rockwell created the now iconic look for their covers. From there we jump to the 1930s when soft drink giant Coca-Cola used Santa Claus in the first of their advertising campaigns. After this, Santa appeared in as a slew of other retailers’ advertisements. From that first Coca-Cola campaign in the 1930s until present day, Santa has sold everything from beverages and food items to household items and more. There are a few reasons Santa Claus has been an enduring figure in advertisements. One reason is that he is a Public Domain character, which makes his name and likeness available to use in any manner the advertisers would like to use it. This makes “the Big Guy” an easy character to put in the advertisements quickly. Additionally, as a society, we have long associated the character of Santa Claus in all his names and forms with Christmas. The concept of being good and having a special gift given to you is something ingrained in a lot of people from childhood. Using a symbol from their childhood makes Santa Claus a good, easy way to subconsciously sell something to the masses. Santa Clause becomes a symbol, one that evokes nostalgia for many and a feeling of deserving a reward for their self-assumed good behavior. This makes Santa Claus the perfect character for an enduring relationship with advertising during the holiday season. I hope this article sheds a little light on Santa Claus and his role in American Advertising. Whether you celebrate Christmas or not, I hope you have a great holiday season and a lovely ending to 2018!